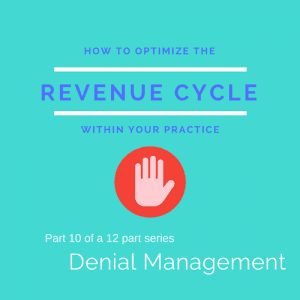 This is a series of 12 blogs written at the request of CodeQuick to help Medical Practice Administrators optimize the revenue cycle within their practice. Please contact C Business Services if you have any questions or would like more information. It seems payers these days are finding more and more reasons not to pay clinics in full for submitted claims. From non-covered services to ineligible diagnosis, these reasons for denied claims are varied and differ from payer to payer.